Celebrating life through creative self-expression. Winner of the Illinois Art Education Association Distinguished Service to Art Education Outside of the Profession Award and the New Initiative Award from the Business Committee for the Art, Inc. and Forbes Magazine. Created by: The Great Frame Up. The Lisa Show, formerly the Creative Self-Expression Show, is for everyone—the artist, the instructor, the parent, the community. We understand this artistic-chain, and want to recognize all of the behind-the-scenes efforts, from the hard-working young talent to the enthusiastic and dedicated art departments. The Lisa Show reaches out to everyone. The show was introduced to high school art classes in 1995 when The Great Frame Up founders, David and Marlowe Klitzky, realized funds for local high school art programs were diminishing. The solution was this program, where their seven Chicago-area Great Frame Up stores adopted community high school art departments, providing supplies such as artist portfolios, mat board and custom framing for over 700 pieces of art. The stores sponsor 27 juried art exhibitions for their adopted high schools with the framed artwork showcased. Each high school’s art gallery exhibitions at The Great Frame Up are on display for three weeks (exhibition dates below). All participants receive a certificate of recognition and the best-of-show winners receive cash awards. This gallery showing serves as a great opportunity for young artists to earn recognition, and see their artwork framed in the light of a professional gallery. During the course of 2002, David and Marlowe’s daughter Lisa lost her battle with a very rare form of cancer. Among a great many things, Lisa was an artist and loved to express herself in her work as a graphic designer and in her paintings and drawings. 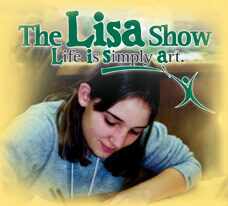 In memory of Lisa and her love of all things art, we renamed the Creative Self-Expression program The Lisa Show starting in 2003. Further, we have given a definition to Lisa’s initials that we believe captures the essence of our philosophy. Lisa = Life Is Simply Art. The Lisa Show has received the New Initiative Award from the Business Committee for the Arts, Inc., and Forbes Magazine, and the Illinois Art Education Association Distinguished Service to Art Education Outside of the Profession Award. The IAEA award recognizes companies that have provided outstanding support in the arts for over five years. In addition to national recognition, 40 pieces of art from The Lisa Shows are currently on display at the new University of Chicago Comer Children’s Hospital designated gallery. This year, The Great Frame Up will be giving away over $100,000 in art supplies and scholarships. All told, the stores have donated over $1 million in materials and time to support this program. so come in and support your community's up-and-coming artists!